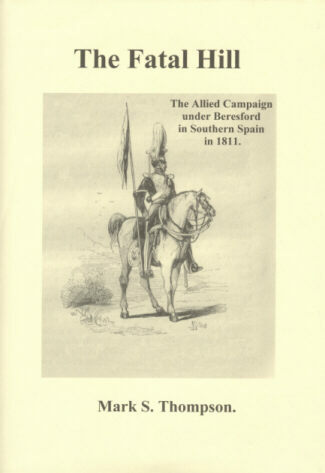 Thompson, Mark S. The Fatal Hill: The Allied Campaign under Beresford in Southern Spain in 1811. Sunderland: Marks Thompson Publishing, 2002. 228 pages. ISBN# 0952293072. Hardcover. £25 ($40). One of the lesser-known campaigns of the Peninsula War was the campaign waged by the British in southwest Spain to capture the key border fortress of Badajoz in 1811. It is most remembered because of the bloody battle that ended the campaign – Albuera. There the British Army fought French troops commanded by Marshal Soult and came close to being annihilated. Although they still held the field at the end of the day, the staggering 40% casualties among the British troops would the highest of the war and, in the end, the British had to lift the siege of Badajoz and retreat back to Portugal. Badajoz sits astride one of the two historical invasion routes between Spain and Portugal and control of the city was a must for any force conducting operations in the area. Badajoz fell to the French in March 1811 – about the same time Wellington was evicting the remnants of French Army of Portugal from northern Portugal. Although Portugal was finally free of the French, French control of Badajoz posed a threat to Lisbon that Wellington could not ignore. The British had to seize it, before they could take the war to the French in central Spain. Unfortunately for the British Army, Wellington could not simultaneously command the forces in the north, where a sizable French threat laid, and direct operations in southern Portugal. The Albuera Campaign would be a rare instance where he would have to delegate authority and give a subordinate an independent command. Marshal William Beresford was appointed to command the southern forces and the campaign he waged would be the most controversial of the British Army during the Peninsula War. The soldiers and subordinate commanders did not trust Beresford; they suffered from Wellington’s absence. The fact that the campaign was not a disaster could only be attributed to the courage of the troops. There were numerous actions where the British cavalry both distinguished and embarrassed itself, successful and failed sieges, minor battles, and one of the costliest battles fought by the British during the war. The campaign was marked by both unprecedented cooperation between the British and Spanish forces and huge casualties among the British troops. In the end it achieved little and in the years to come there would the senior British participants waged bitter public arguments over it. The Fatal Hill covers all aspects of the campaign – the reasons why it was waged, the forces involved, the internal politics of the British and French Armies, logistics, and movements of the armies. The author describes in great detail the numerous minor battles and actions, including Campo Mayor, Gebora, and Villa Garcia. His thirty-page description of “Bloody” Albuera is a masterpiece. He presents the combats in a logical matter, combining the separate pieces of each into a cohesive narrative that is easy to following and exciting to read. Particularly moving is his account of the destruction of Colborne’s Brigade by the Polish lancers and the massive firefight between the British Fusilier Brigade and the massed French infantry. He is adept at putting the reader in the front line with the troops using the many eyewitness accounts, written by British, German, and French participants. The strength of The Fatal Hill lies in the author’s superb description and analysis of the bitter feud that General Robert Long had with Marshal Beresford and his chief-of-staff, D’Urban, and Marshal Beresford’s battle with William Napier, author of the first major history of the Peninsular War. General Long, the commander of the British cavalry during the campaign, was relieved from his command for incompetence by Marshal Beresford and he never forgave him for it. The Beresford – Napier feud arose when Napier published the 3rd volume of his History, in which he was less than kind to Beresford, basically accusing Beresford of bungling the campaign. The Fatal Hill provides a fresh look at these controversies. Mark Thompson is an expert on these feuds and has published in four volumes the numerous pamphlets printed with the charges, counter-charges, and refutations, by the various parties in the mid-19th Century. (These books can be ordered through the MST Publishing site.) He presents all sides of the arguments in a clear, concise way that allows the reader to draw his own conclusions on whether Long was incompetent and Beresford a bungler. In addition to an outstanding narrative of the campaign and the factors that impacted on its outcome, The Fatal Hill contains 24 maps – many of which are contemporary, while the rest were drawn for the book. These maps accurately portray the actions and events discussed in the text and are well placed with the text. There are portraits of key personalities, detailed orders-of-battle, and casualty figures by regiment. The author also provides two real gems that I had never seen before: Wellington’s plans for the campaign and Beresford’s after-action-report!